Annie’s mind is broken. As the sole witness to the brutal murder of her father, can she put the pieces back together and identify the killer? Who is the victim and the perpetrator in this story of unthinkable acts and damage that can’t be undone? 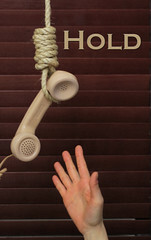 Hold is a dark, absurdist comedy about a man who calls into a hotline for help and keeps getting put on hold. Each successive person he encounters is stranger, funnier and more disjointed than the next, until he encounters his worst fears over the phone.